"Whoever can remain silent everyday for a full year becomes worthy of thousands of years of praise in heaven." - Chanakya Niti, 11/9. Silence. The term is associated with stillness and the complete absence of sound. Practicing silence is a simple, yet powerful way of connecting oneself to the Creator. It is interesting to note that all the major religions have this practice mentioned in their scriptures in some form. In India, this practice is known as 'mauna vratam', ie. the vow of silence. This is a personal pledge to refrain from speaking. Some of the famous followers of this practice include Mahatma Gandhi, Swami Sivananda and Deepak Chopra. "In the attitude of silence the soul finds the path in a clearer light, and what is elusive and deceptive resolves itself into crystal clearness." Silence is not confined to only verbal silence, but stillness of mind as well. Practicing silence (stillness of thoughts) is just another form of meditation. Inner mind chatter is gradually reduced until a state of no thought (Samadhi) is reached. Silence enables one to be in touch with the Divine within, which is the source of all inspiration by which talents of the world without tap into. 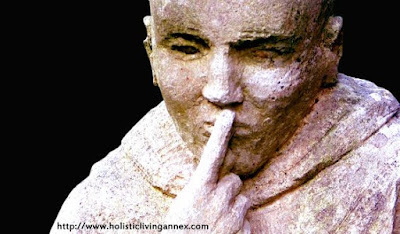 The saying 'silence is golden' probably originated from this practice! It is no secret that some of the top successful people practice silence to gain inspiration to produce their masterpieces! By practicing silence, we will also be more attuned to the Creative energy within by which we can draw power from to sustain greater success in any positive activity. Is it not interesting to know that silence, which appears to many as nothing great, is in fact the source of many creation?! Great ideas, inventions, compositions and others all originated this one power, Silence, which awaits Man to be inspired. Genevieve Tan Shu Thung in her lectures constantly reminds one that a still mind is likened to a calm pond whereas an unsettled mind is similar to a raging ocean. As the mind is a powerful instrument that can change one's life when mastered, understanding its nature cannot be stressed enough! In the Indian schools of thought, the practice of silence is proportional to the degree of harmony experienced. There is even a festival in India devoted to the practice of silence! It is called "Mauna Ekadashi" (Ekadashi is the 11th day of Hindu lunar fortnight. Ekadashi is the day of celebration occurring twice a month, meant for meditation and expansion of consciousness). On this day, a person is to refrain from uttering a single word for the whole day. Many have said that this practice bestowed them peace of mind and strength to the body. In Deepak Chopra's book, 'The Seven Laws of Spiritual Success', it is recommended that silence is observed for 20 minutes daily. Silence directs the expression of creative energy from within to without. There are many people around the world today using its power to create success in everyday life. “When you go into this experience of silence, initially your internal dialogue may becomes even more turbulent and you may feel an intense need to say things. But as you stay with the experience, the internal dialogue beings to quieten. And soon the silence becomes profound. Then, as the internal dialogue quietens, you begin to experience the stillness of the field of pure potentiality. At this time in silence one can introduce a faint impulse of intention in this field, and the creation of your desire will come about spontaneously." - Deepak Chopra. Therefore, throughout the day, do your best to practice silence. You are sure to see for yourself the benefits of this practice. Very interesting article! All can be achieved with silence. So long we are still, we can make wiser decisions instead of impulsive ones. Much is loss through impulsion. Keep it up! Then I suppose those who are dumb are very spiritual then? I don't see them producing anything great?? How rude! I think you mean "mute" K9! K9!! You never know.. they might look dumb in your eyes, maybe one day they achieve better then those who acted smart..Everything takes time and your deepest self-awareness (which is silence)..
All of you... shhhhhhhhh! Silence. Maintaining the inner silence will give us all peace. Well done! Silence is the highest gift one can gift to oneself. That's what I think.